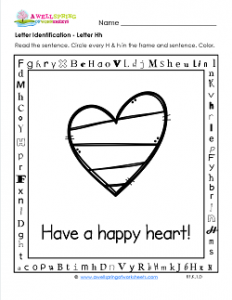 “Have a happy heart!” is the theme of this letter identification worksheet. Let the happiness continue as you have your kids find and circle every h on the page. Have them look for the uppercase and lowercase h in all the different letter fonts in the frame. There are 12 of them – three on each side. And while they’re at it, they can search for the hidden sight word “she”. It’s in the top part of the frame. If you have a boy named Tim he will find his name in the bottom part of the frame. Have the kids color this cheerful heart.